One thing we always love about TriRig is they rarely (never) release just one product at a time. Nick (owner of TriRig) has truly taken the one-more-thing approach to product announcements that Apple always does so well. So when he started talked about new extensions and aero bar plugs two weeks ago, we knew that he probably had something else up his sleeve. But he made us wait to find out what it is. And now we’ll pass on that favor… you’ll have to scroll down a bit before you see the big reveal. 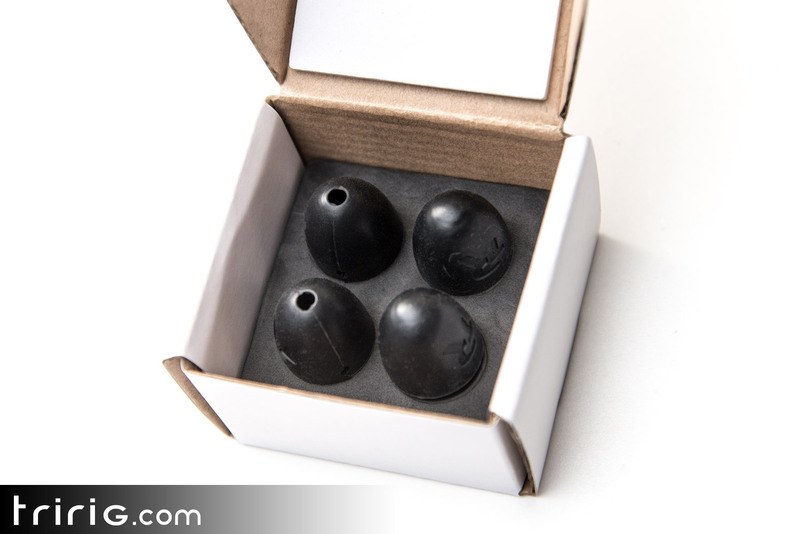 So first, lets cover the new Gamma extensions and Aero Bar Plugs from TriRig before we get to what you’re waiting for – the TriRig Alpha One. Nick began his big reveal with two new extensions to add to the original Gamma (now renamed Gamma 16). First is the Gamma 24, which features a 24-degree single bend (as compared to the original Gamma 16 with a 16-degree bend). The Gamma 24 can be inserted in either direction. Like the 16, the 24 is meant to be cut in either end to fine tune reach and rise. The 24 features 190mm of reach adjustment and up to 102mm of rise (when inserted long end up) or 67mm of rise when the short end is up. The carbon version features a textured grip surface for those that choose to forgo bar tape. 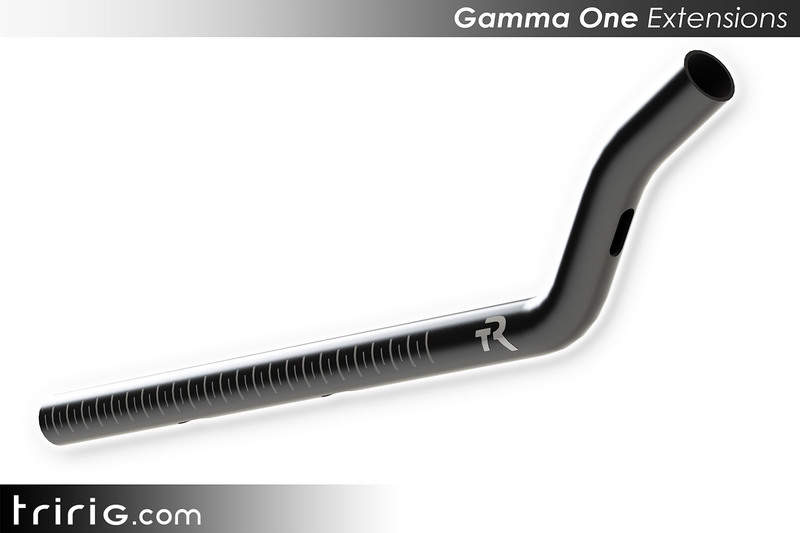 The Gamma One is a double-bend design featuring exactly 75mm of rise. The hand grip angle is 24 degrees to the horizon. The One features an extra-long 240mm of reach adjustment. And Like the 24, the Gamma One features a textured grip surface on the carbon fiber versions. 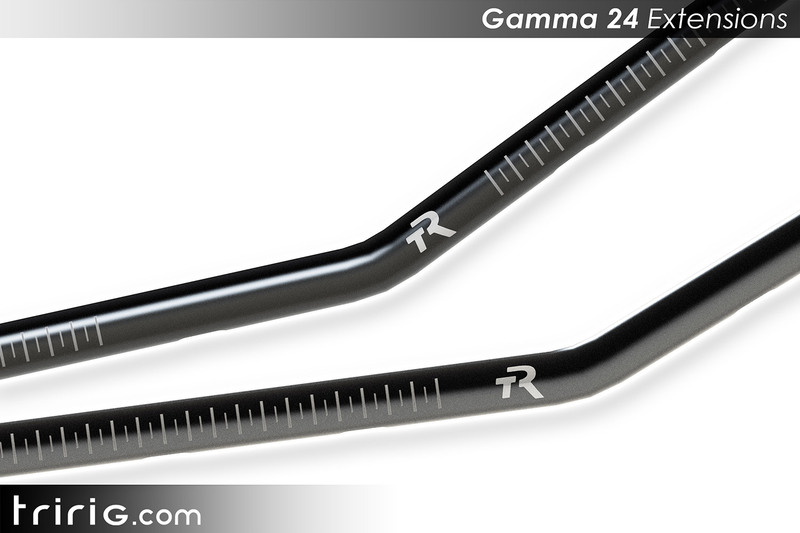 Both the Gamma One and 24 have a total length of 400mm. Next came a quick showing of his new aero bar plugs. 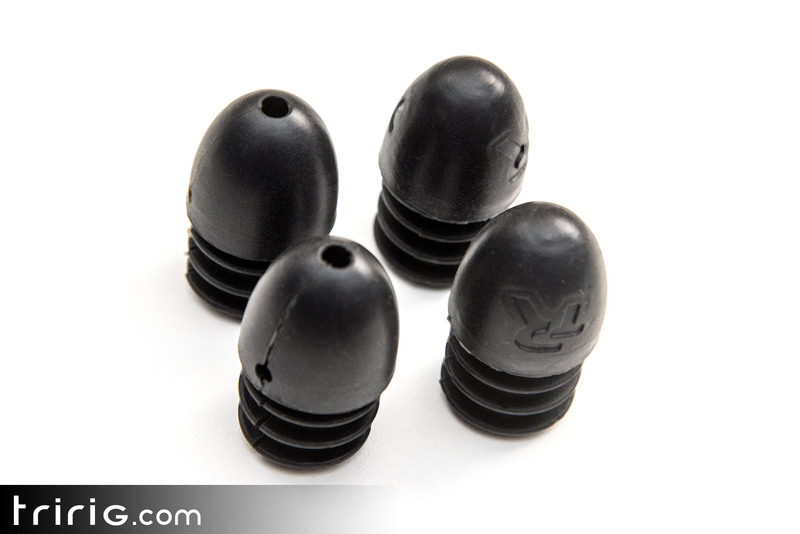 The bar plugs come 4 to a package – 2 fully sealed, and 2 with cable openings. 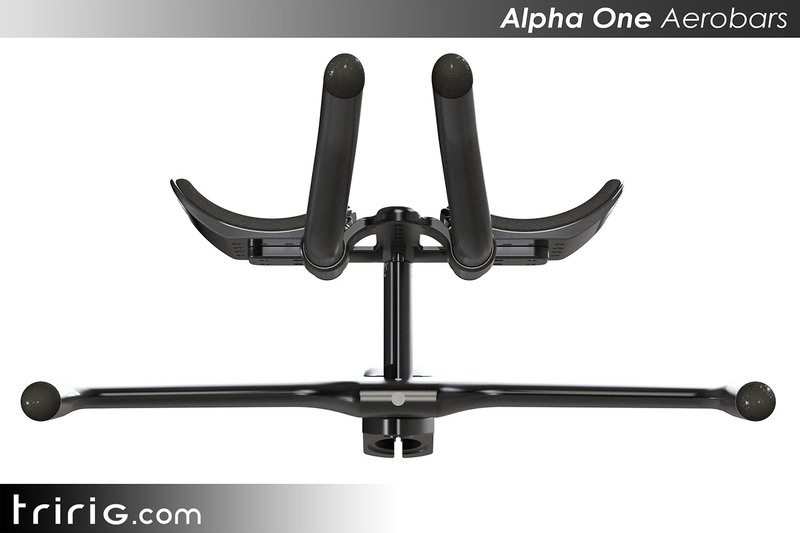 All new Alpha Ones will ship with the Bar Plugs included. And speaking of the Alpha One, it’s time to get to Nick’s one-more-thing moment. From the moment we started talking about the Alpha One, Nick made one thing clear—this was the most important product he has ever created. We thought that was a pretty bold statement considering this is coming from an innovator who started with brakes that are now found on Tour de France frames and most recently has launched his own bike frame. But his new cockpit is the idea he holds in highest regard. And after spending an hour on the phone with him, we understand where he is coming from. 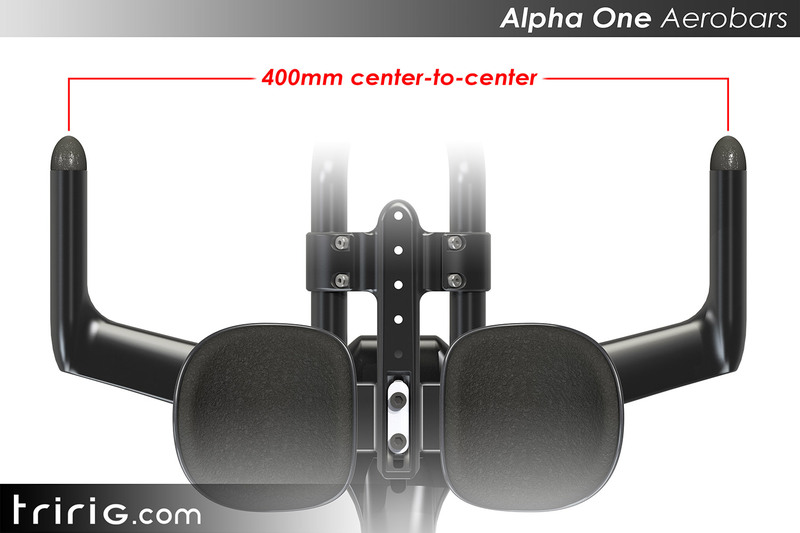 The Alpha One is defined by its mono post design. No, it’s not the first mono post we have seen on a TT\Tri frame. But it’s how the mono post is used that is so revolutionary. 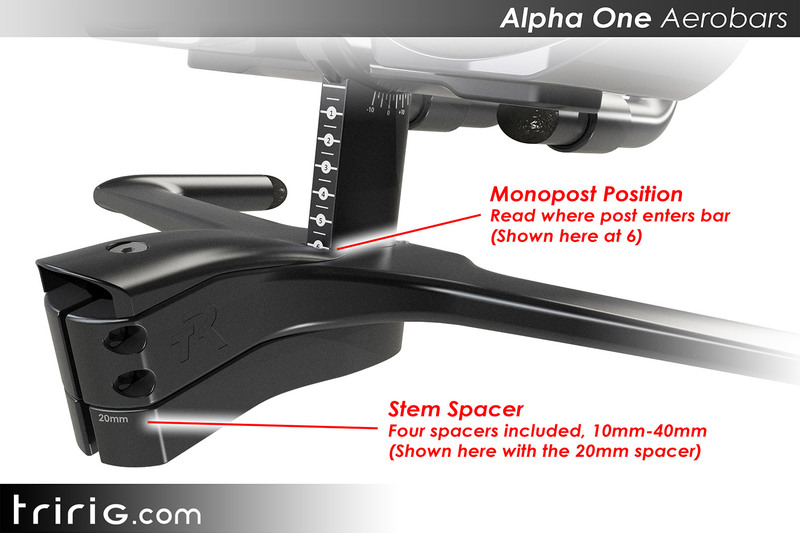 The mono post is designed to allow for the easiest and simplest stack adjustment ever found in a TT\Tri cockpit. Featuring 80mm of continuous total rise, the mono post flows through the basebar allowing for the most minute of adjustments. A single 4mm hex bolt (speaking of which, all but one bolt in the Alpha One use a 4mm hex bolt, making for a very small tool kit needed) controls the torque on the mono post, so adjustments can be made simply and quickly. 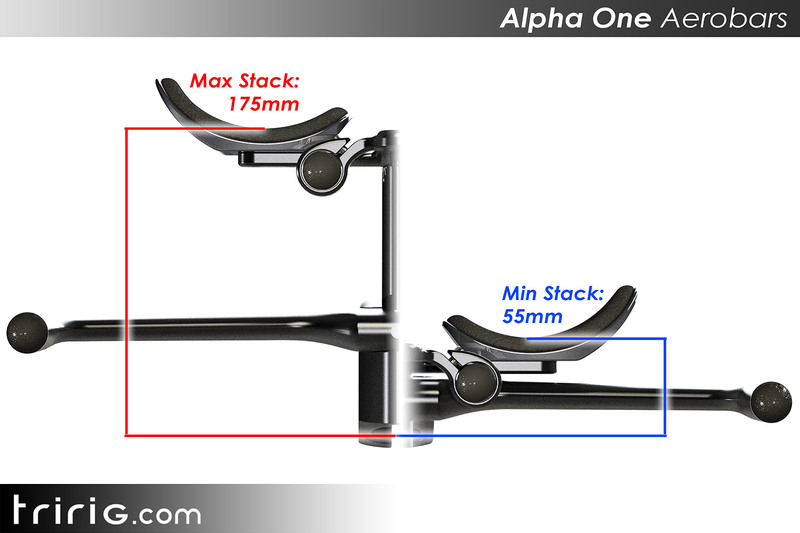 The 80mm of adjustment (plus adjustable stem heights we will cover below) allows a maximum stack of 175mm and a slammed stack of 55mm. The single mono post design also makes travel a breeze. Simply undo one bolt and the whole top of the cockpit can be removed. The cockpit features from -10 to + 17.5 degrees of tilt. 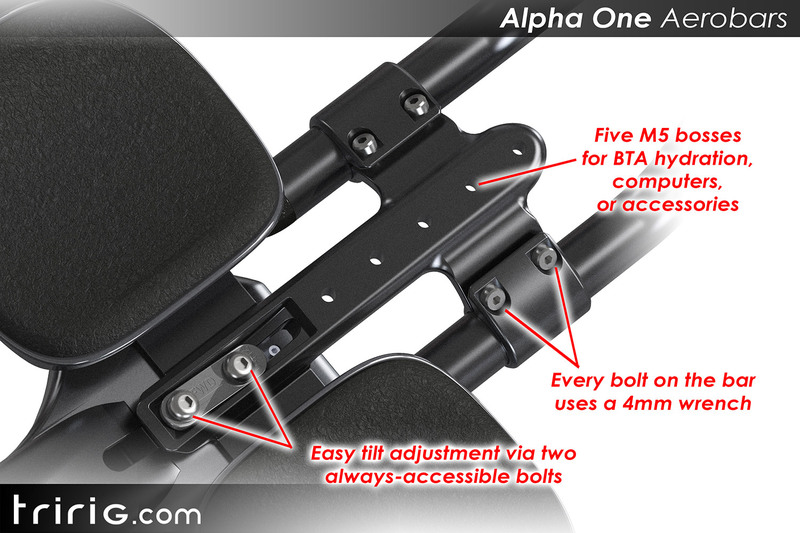 Tilt adjustment is controlled via two bolts that are accessible regardless of arm cup position. 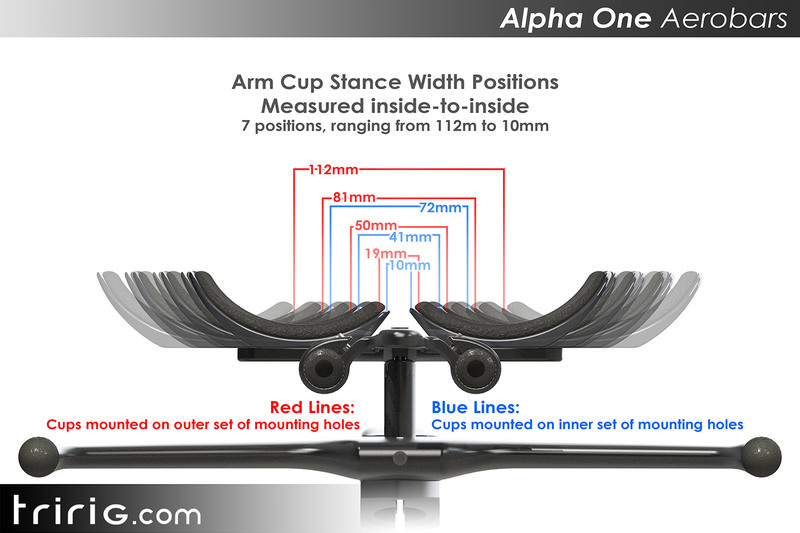 And tilt axis is directly below the arm cups to preserve your stack and reach coordinates. Tilt is available at all stack heights, including fully slammed. 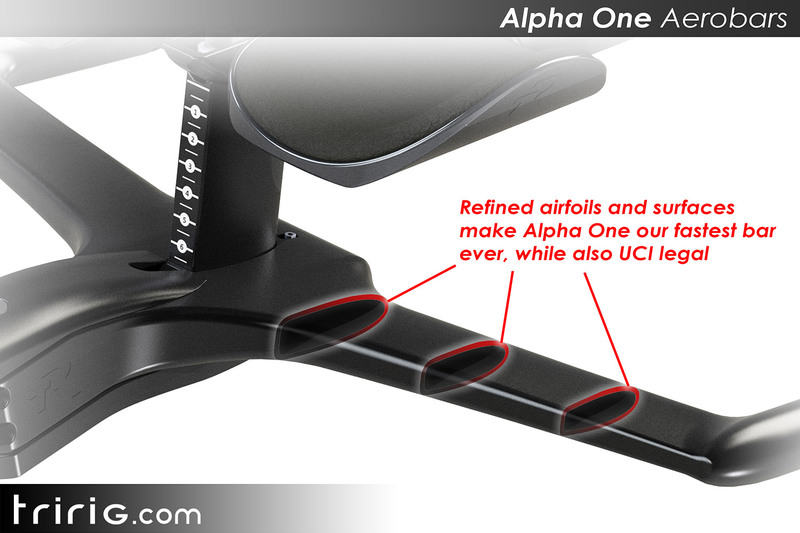 The integrated stem features 4 aeromatched spacers for height options of 10, 20, 30, and 40mm. And is designed around a standard 1-1/8” steerer tube. There is room in the stem to easily run cables and room at the back for cable exit. A universal centerpull cable routing works for bare wire, full housing, or hydraulic line. To hide the inner workings an aero cable cover collects and hides cables once you have finished your routing. The included arm cups are TriRigs new ergo cups. 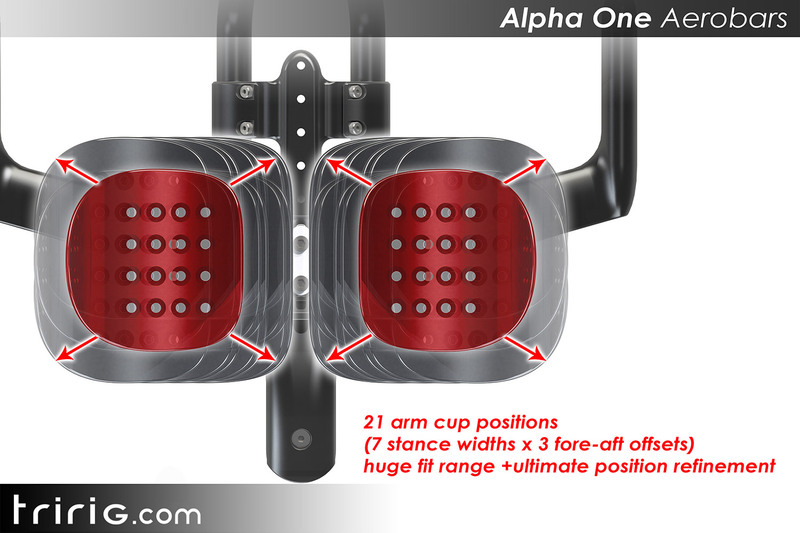 The Alpha One features 21 arm cup positions – 7 stance positions (based on 2 mounting positions and 4 holes per cup) and 3 fore-aft, resulting in a total of 21 different options. The aerobars are attached via standard 2 bolt c clamps making for easy adjustments. 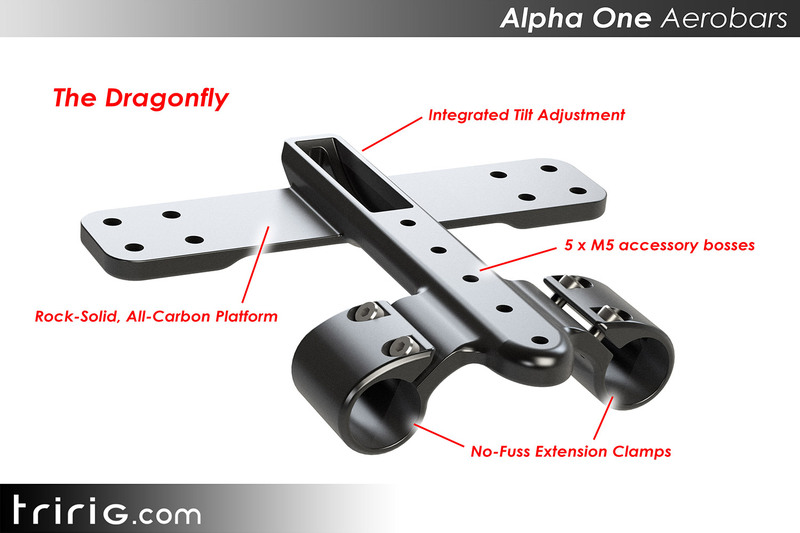 The “Dragonfly” integrated BTA adapter features 5 mounting holes, allowing you to mount multiple bottles in multiple positions based on your needs. Surprisingly, the bar is UCL legal. Because of size and design constraints, the mono post itself is 3:1 ratio. And the base bar was found to be fastest at a 3:1 design as well. Nick told us he tested via CFD much deeper bars, but the 3:1 version was the absolute fastest. Speaking of fastest, Nick also tells us the One is faster than the X. How much faster and what criteria he used he didn’t say, but he was quite insistent that this was the fastest cockpit he has designed yet. He also shared that, even when fully slammed, the mono post hanging down was at worst aero neutral. 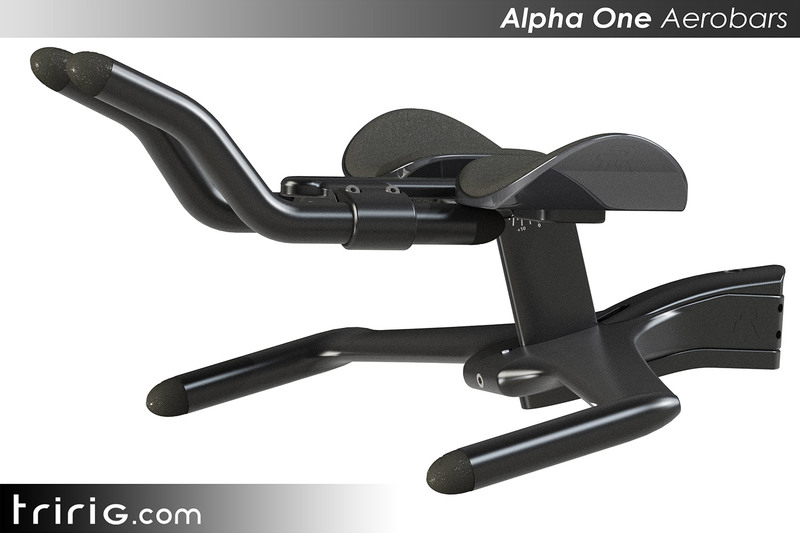 The Alpha One is available for sale today for $999 with shipping planned for March. Check out the video below to see the One in action. Whenever we are asked our opinions on a bike for a specific athlete our answer always starts with fit. If you cannot stay aero, no bike is going to make you faster. But fit isn’t a one-time metric. Throughout the season, our bodies are constantly changing due to both increases in athleticism and the regular injuries that endurance athletes suffer. 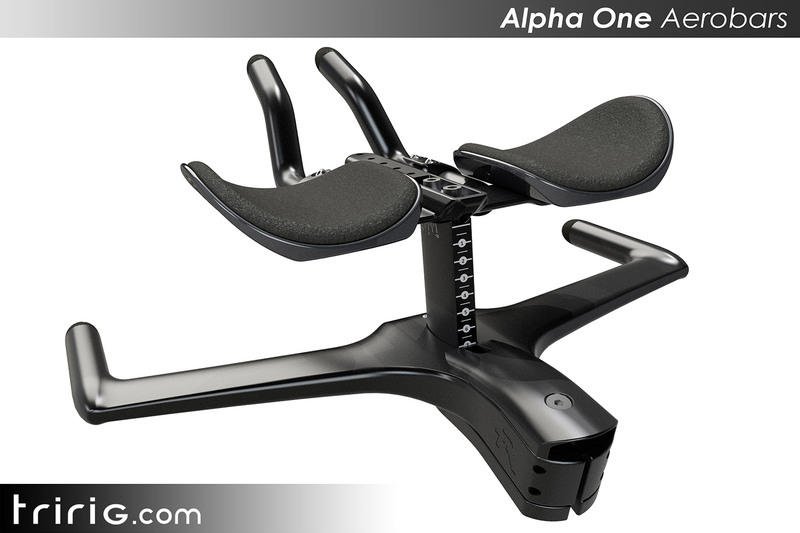 The Alpha One is the first cockpit we can recall that allows us to quickly and easily change our fit to adapt to the ways our bodies change. We can dial in our fit to start the season, and as the season progresses month by month—or even day by day if we wanted to—we can make the tiny adjustments to keep us most aero for any given race. If your body starts to fight the aero position during long-course races, we could even see someone stopping for 30 seconds to pull a wrench out of their bag to bring the bar up a smidge. 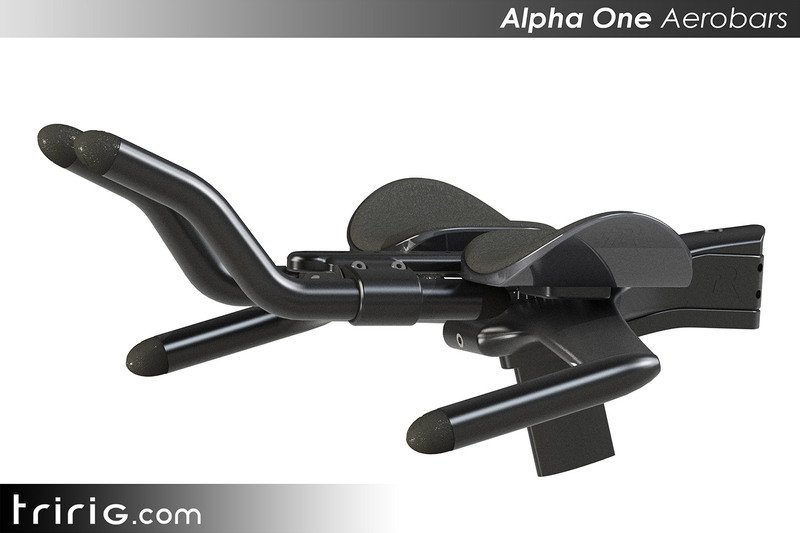 We also like that you could easily start a trainer session out on your original fit, drop it 5mm and see if power numbers and comfort remain, and then put it back to the original position, all while you continue pedaling. We also really like the small details. A single 4mm wrench covers all your regular maintenance needs. Tilt is always adjustable regardless of cup positions. And speaking of those cups – we have heard from those that have gotten a chance to ride with them that they are truly some of the more comfortable cups in the industry. 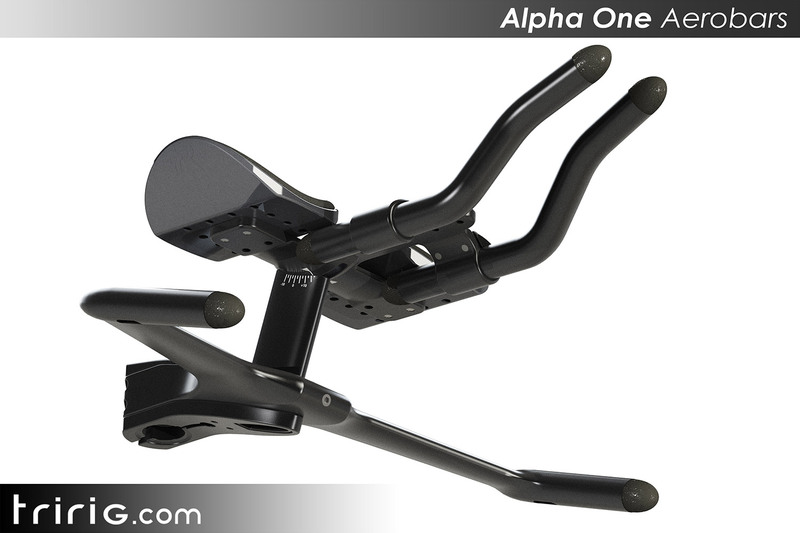 We are looking forward to spending some time with the Alpha One. Our P2 test bike is sitting on standby for a TriRig box to arrive so we can start getting it all cabled. So, Nick, here’s looking at you to get one out to us. And until then, check AeroGeeks.com for the latest news and reviews.